What a thoroughly enjoyable and thought-provoking evening with Sandra Morrison and Alistair Parkin at Kirkley Hall in the company of much knowledge, experience and enthusiasm from everyone. The evening was open to non-members which allowed for a Pony Club member to come along with her a Mum as well as local Riding Club members. The format was friendly and encouraging with a good emphasis on discussion and acceptance of differing points of view, all leading to the same end of education and improvement of methods to produce a happy healthy horse. 1. What is your fundamental understanding of bits? 2. What is your understanding of acceptance of the bit? 3. What is the responsibility of the rider’s hand? 4. What is your understanding of contact? It was targeted at bits and bitting and was most helpful, including the practical interlude which produced much hilarity! – Re assembly of a snaffle bridle while blindfold, the Pony Clubber won! 6. Is the snaffle the best option for introducing the bit to the horse? 7. How do you cut through the marketing of new bits to make the right choices? 8. Is a bit really necessary? A good venue, well supported and organised and producing good results. Much needed up in this part of the world. As I sit here in the grip of Storm Emma and De Beast from De East I decided I’ve done enough snow shovelling and I would set about the Spring Newsletter. As usual I am overwhelmed by the continued enthusiasm of our members. After another fabulous two-day Annual Course at Addington Manor Equestrian Centre where the days flew by as we flitted from one arena to the next watching and listening to those two great gurus Christoph Hess and Christopher Bartle, I felt 2018 had certainly arrived. David Sheerin had organised some really useful booklets which have made a great keepsake/memory of those two days. As a slight sideways tilt Sam York gave a very good lecture/demo on the use of technology in equestrian coaching by taking us through the dynamics of the “Equla Vert”. Also on day one David Seamark and his seven sheepdogs demonstrated working with a group of geese to show the Trust between the dog his Master and the other dogs as they worked as a team around the jumps and people in the arena, gently pushing the geese into a horse shoe shape formed by members of the audience. The dinner was well up to its usual standard and the AGM saw the retirement of our long standing Treasurer Judith Murphy. Debbie Follett has taken up the reins and we all wish her luck – big boots to fill Debbie. There were more winners for our trophies – Andrew Bennie the Achievement Award, Ruth Baxter the new Tom Searle Award and posthumously Tom Searle for Pat Smallwood Award. Mr and Mrs Searle joined us for dinner and to accept this award on Tom’s behalf and for me this was an emotional few moments as we all looked to our own memories of this young man. As a reminder the Pat Smallwood Award is now presented by the F&I Association to “an instructor who has put exceptional effort into the Equestrian Industry in a voluntary capacity” and for the committee this was Tom. The Achievement Award just had to be presented to Andrew Bennie for all the Eventing Judging he has recently done world-wide including a recent small 4* in Rio. Finally, a new award the Tom Searle Award presented to the Association by David Sheerin as a memorial to Tom for the person “who shows all the elements of being Supportive, Involved and Inspirational” The recipient had no idea and a very surprised Ruth Baxter stepped up to receive the trophy from the BHS CEO Lynn Petersen. Following dinner, it was straight into the entertainment which was ably produced and monitored by Sam York and Lisa Morris. Certain of our members proved just why they are at the top of their profession and also have such a successful competitive life as they “fought” to put together a double bridle blindfolded and tie a hunting stock blindfolded in record time. It was quite hard work to get back to reality as Faith and I flew home to Ireland. Extremely good reports were written regarding the dressage sessions – Faith Ponsonby – and the jumping – Joanna Shields – thank you to those kind souls. Then the year commenced in earnest as in mid-January came the fascinating regular study day at Talland, a super report followed from Sam Goss, and everyone was once more into the swing of the F&I calendar. Thank goodness for our Face Book page as that is the place to go for the photos as you await the reports. The Richard Waygood day at Wellington was as inspiring as ever and at this moment I’ve had a sneak preview of Sarah Thorne’s report we await some photographs to go with it. Unfortunately, the weather has caused a cancellation of the day with Nick Turner at Hunters Gate Eventing, Cheshire, but this is rescheduled for March 27th. Also, in March Sandra Morrison is starting a series of evening lectures at Northumberland College for those in that part of the country. 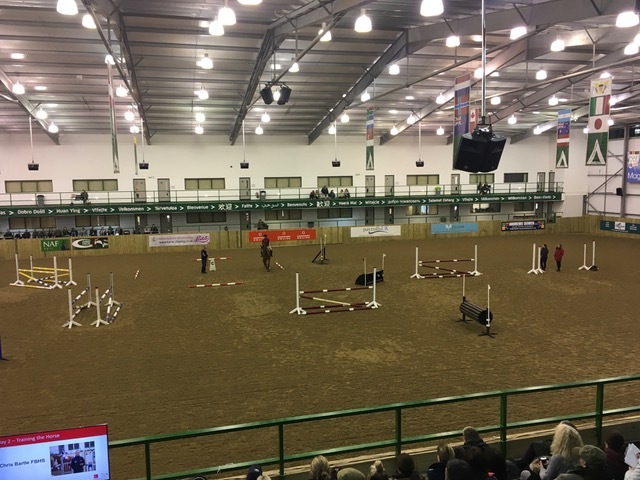 Then there is training at Millfield with Danny Anholt whilst the National Equine Forum in London has two delegates namely Sarah MacDonald and Mandy Luesley. Moving swiftly on to April Sarah Simpson has offered an insight into the Leahurst Equine Unit and Ruth Baxter has an evening with Yogi Briesner for her area of the BHS and we are able to join at a very reasonable rate. May brings Badminton Horse Trials and the annual course walk organised by Ann Bostock, don’t be late at the meeting point or you’ll be “drummed out the Brownies”. Once Ann arrives home from Badminton there’s the Judy Harvey Training day on May 8th. June also sees the visit to Ireland when Faith has again called in favours and we’re off to visit Irish show jumper Greg Broderick. Not only will we get to see the fabulous training facilities but also Greg’s breeding section and follow this with a lunch at McCarthy’s pub renowned for its good grub and onto the Horse Museum in Fethard. Meanwhile at Bramham Horse Trials Friday 8th Ruth Baxter has organised a most interesting session to watch and evaluate the Burghley Young Event Horse 4 year olds & 5 year olds. July is our Hickstead RIHS Ladies Day social, of course. The Fellowship takes place in October and there are several training days taking place for this renowned riding and training qualification. And yet more events are in the planning stages. More details of all events can be found on the F&I website and Facebook page so please do take a careful look. As an Association we will all be coming under the GDPR European Data Protection 2018. You should all have received a consent form by now and I hope you’ve taken the time to fill it out and return to our new Treasurer Debbie Follett. This does raise some problems with all our training days, evening lectures and course walks as the organisers need to ensure all eventualities are covered regarding guests and then storage of those forms in a safe place. But we are getting there and are being guided by Julian Campbell who as well as being a member also works at the BHS offices Abbey Park. PLEASE do consider arranging a gathering in your area, it can open up to non-members and if you first just run it past myself there’s a chance the BHS will award the training days CPD points. Members of the committee will be happy to advise and help you and Di will send on the Organisers Pack. We would prefer if it covered all expenses but not everything needs to make money – it’s the satisfaction of seeing more F&I Days being put on across the country and the wide variety we can make available. On a sad note, we have recently lost one of our stalwart FBHS colleagues, Helen Webber. F&I were well represented at her funeral, and she will be much missed. It just remains for me to wish each and every member the very best for 2018 and I hope to see you at some of our ventures.